To find good food in KL though outstation people may find it hard, but for local they will say that’s not true. For a Penangite like me without a GPS, I normally remember each place by heart. Just take this as example… many years ago, I took my family down to KL for a break, and that time we were lingering around town and don’t know what to eat. Ended up we landed at this place. 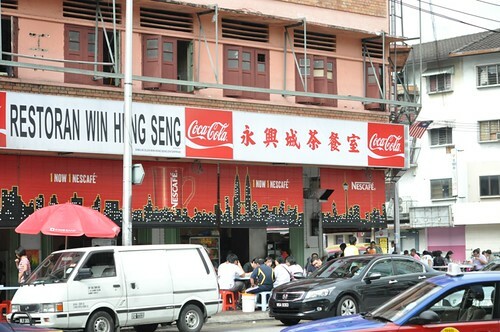 Yes, this place – Wing Heng Seng Coffee Shop in Jalan Imbi. I remember clearly most of us took the soup version of Pork Noodle, thus this time round I took the same for myself. When I looked at my bowl of noodle, I could feel satisfactory before eating it. Reason?? Oh, that’s simple, look at the medium rare cooked liver just make me drool over it! 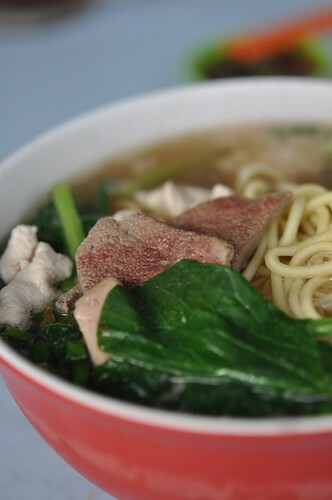 Hubby was looking around other tables, and he noticed, mostly have another type of Pork Noodle, which he noticed, there are some Pork Sausages that is in a bowl of soup, and a handful of minced meat with spring onions on top of the noodle. That honestly attracted his attention. Without second thought he has a bowl of that, and he was happily having it cuz, that’s nothing we could find in Penang. It was truly a happy breakfast! Oh ya, due to many customers waiting for table, there was another lady was looking for a place to have her breakfast, of course, we wouldn’t mind having another person sharing the table with us. And guess what she was having then? 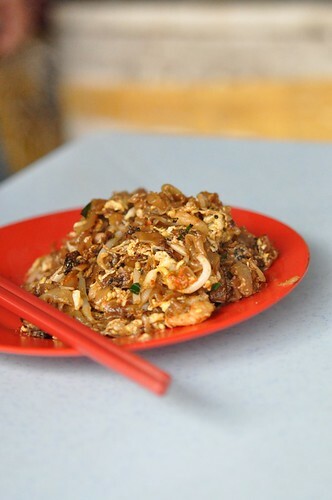 A plate of Char Koay Teow… and mind you … it was absolutely fragrant. By looking at it, without any hesitation I just took out my camera and have a few shots on it. I bet she was wondering what is that to shoot? I bet you’re a breakfast person that wants to have good breakfast, right? I would recommend this place if you’re down in KL for a break. Apart from these noodles, in fact, there’s a pastry stall that’s selling egg tarts and etc. The egg tart is absolutely mini in size and it costs RM0.50, though you may find it expensive, but it’s a must to have. I didn’t get to have any as they sold out pretty fast. Got to bake again for another batch of customers and I could see people lining up for that… thus, the egg tart is truly recommended. I"m eyeing on that bowl of pork ball. yummy..
LOL you really know where to hunt eh! the pork ball noodles is one of the best in town. our fave kopitiam too. btw at night have dai chau noodles! This pork ball noodles is famous!!! Simply delicious, err...but I can't accept to have medium rare pork liver. Ya, during my last trip down to KL, I buta-buta drove around and spotted this kopitiam and ordered the pork noodles too! lucky me! try the KL Hokkien Mee at night, a popular night joint too. I think the white chicken dry keuy teow here is good! The pork ball noodles is very famous in KL. It's my hubby's favourite breakfast.